A couple of posts ago, I mentioned that I had been trialling a new shampoo/condioner duo that I was really enjoying using. Well here I am, reviewing them! JASON is a well established brand that offer products made only from natural resources. No artificial colours are added, the bottles are biodegradable and no products are tested on animals. Win! 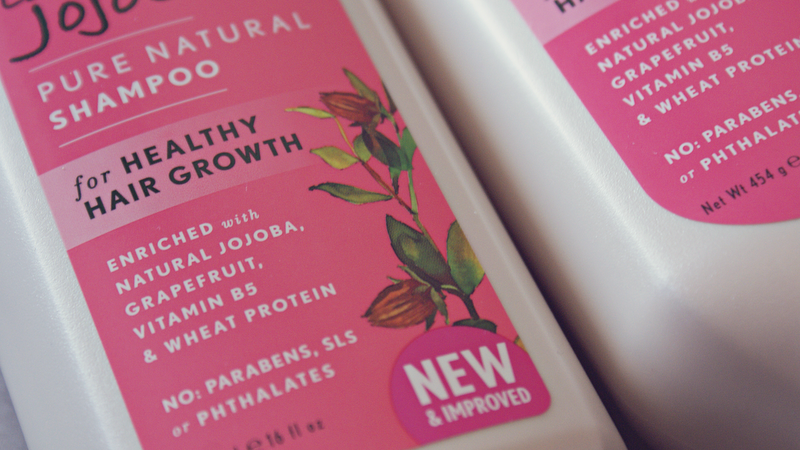 JASON have a wide range of different shampoo/conditioner duos but I simply chose the 'jojobo' duo as the bottles are pink! Sucker for packaging, I know! The shampoo takes a while to lather up and doesn't have the same 'amount' of lather as a regular shampoo, which I think is down to the natural ingredients. They claim to make weak hair stronger for maximum growth which is something I was really intrigued by. My hair tends to get to a certain length and just stop growing, but I'm pleased to say I think (maybe it's 'cos I'm waiting for something to happen?!) my hair has grown maybe more than an inch since using these (around 3 weeks), on and off with bottles from the VO5 range. The only thing I didn't like about them is the smell! I think jojobo in general smells like roses. Roses remind me of old ladies so every time I used these, my hair would smell like roses. However, saying this.. I am keen to try out some other ones from the range, so maybe I'll find the perfect one for me! Have you tried any JASON products? Let me know below! Oh i'm really intrigued by this, i'm the same as you.. my hair never growns past a certain point. I'll have to try these out, great review. I heѕіtаte a lot аnd ԁon't manage to get nearly anything done.